Romans 10:1: For this verse search, auto-context will set the Context slider to All. This is because many people use the top search bar as a navigational tool, and when searching for an individual verse, users often intend this to be a starting point for further study. Romans 10:1-5: For this verse search, auto-context will set the Context slider to 0. Since you set a specific range of verses, auto-context assumes you only want to see the versers in that range. Love: For this word search (and all others), auto-context will set the Context slider to 0. This allows you to quickly scan through your search results and add context as desired. Today is the 150th anniversary of the Emancipation Proclamation. I noted that on Facebook earlier today, and referenced Leviticus 25:10, the verse cited on the Liberty Bell: “you shall … proclaim liberty throughout the land to all its inhabitants.” That verse seems appropriate, since the Emancipation Proclamation represents movement of the nation toward the fulfillment of its long-held aspirations. Regarding male or female slaves that you are allowed to have: You can buy a male or a female slave from the nations that are around you. You can also buy them from the foreign guests who live with you and from their extended families that are with you, who were born in your land. These can belong to you as property. You can pass them on to your children as inheritance that they can own as permanent property. You can make these people work as slaves, but you must not rule harshly over your own people, the Israelites. You see the point: the Bible says freedom but it also says slavery. The Bible is a terrible book and we’d all be better off if people abandoned those primitive superstitions and became humanists like Pol Pot, Mao, Stalin, and Hitler. Well. I thought the Emancipation Proclamation was a good thing, but apparently its real value is how it underscores the hypocrisy of the Judeo-Christian tradition. [Name], which do you think? Abraham Lincoln evidently saw 25:10 as trumping 25:44-46, but if you’re more clever than him, that’s your prerogative. I’ve observed how modern critics pick out the verses in the Bible that support slavery and say, “Gotcha! Your religion is evil.” Then they go buy a printer from a company that just announced 5000 layoffs, or a company that switched its offshore manufacturing from Mexico to China. I prefer freedom to slavery, and I think God does too, but freedom isn’t a panacea. My impression is that the Bible’s instructions about slavery tend to place limits on an existing institution, kind of like the Bill of Rights. For example, the verses you cite say you may have slaves but only from the gentiles, not from your own people. In the following verses, it says that gentiles can enslave your relatives but you may not. This institution exists among the gentiles, it says, and you may participate in it only insofar as you deal with them, you may not let it make inroads among your own community. You can see that glass as half-full or half-empty. Would it be better to reform the gentiles too? How would you do that without imposing your religion on them? Since we’re analyzing Leviticus 25, what did you make of 25:3-4, rest for the land? Or Leviticus 25:13, returning property to people who lost it? Or Lev 25:14, the prohibition against cheating people? Or Lev 25:25, the requirement that people help out their relatives (rather than abandoning them to the mercy of society at large)? I was puzzled about a verse I read this morning, and decided to write about it. I also thought it might be useful to share here some of the tools that are available for doing Bible study. We live in the golden age of amateur Bible scholarship. Thanks to sites like Bible Gateway and Bible.CC, if you have an internet connection, you can compare dozens of translations with the click of a mouse. My church uses the NRSV, which is available online, but not in as many places as the ESV, which I find is a pretty reasonable substitute. Sometimes, a quick comparison only leads to more questions about which translation “got it right.” There are two ways to answer that kind of question. First, you could ask an expert. If you don’t know any experts personally, you could go read one of their books instead. Those are called commentaries. If the topic is about something important — grace vs. works, for example — you really do need to ask an expert. But a lot of the time, you just want make sure you’re not leaning too hard on what might be an idiosyncratic translation, or — especially with older translations like KJV — a word whose meaning has evolved over the years. Fortunately, you don’t have to know the biblical languages to do this kind of “casual” search. You can look the underlying words in Strong’s Concordance, which assigns each one a unique number. With the tagged verse in front of me, it was easy enough to pick my word. As it happens, what I wanted was a Hebrew word numbered 4941. Clicking on 4941 brought me not only a definition but a list of search results showing me all the places the word appeared. There were 421 appearances all through the Hebrew scriptures, so I concentrated my search in the wisdom literature (Proverbs, Psalms, and Ecclesiastes). 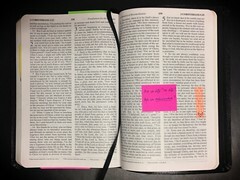 My purpose in this article is to describe how I did my Bible study, rather than to tell you what it taught me. That’s for another article. When I first began to read the Bible 20 years ago, I was frustrated by all the page-flipping. Today, you can flip through not just one translation but any number of them, as easily as clicking a mouse. The blog “God Didn’t Say That” has a useful discussion of three types of errors that occur in Biblical manuscripts. Generally speaking, these errors aren’t all that significant, because they occur in a few manuscripts (duplicates of an ancestral manuscript where the error first occurred) but not in others. The article is interesting, though, because it describes the different types of errors and discusses the different approaches that translators use to deal with them.